Here's the ultimate guide on the 28 different types of yoga you can practice. Some are very similar while others are very different. This article lists and describes each type in detail. I remember 20 years ago when I first got into yoga. I had read about it and the concept appealed to me. I then wanted to start doing yoga from a book (I had no money for classes). Off to the bookstore, I went. That’s when the confusion set in. There were so many different styles. I didn’t know where to begin. I reviewed many styles of yoga for hours until choosing a book to buy. My first yoga book was “Power Yoga” by Beryl Bender Birch. Before starting yoga, I was into weightlifting so the concept of a yoga style that was rigorous and built strength appealed to me. Since then I’ve tried many types of yoga and like most of them. 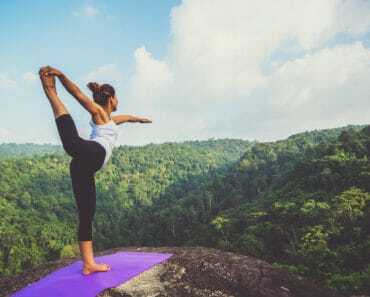 If you’re trying to wrap your head around the different types of yoga, here’s a nicely organized list with detailed descriptions. 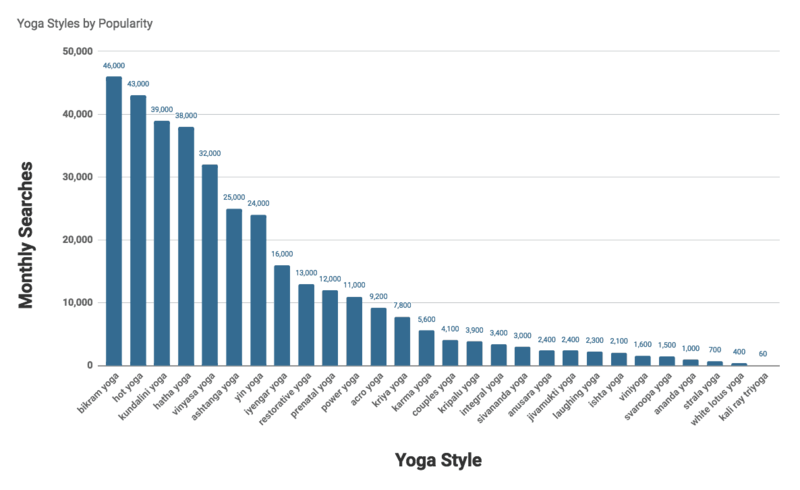 In our list below we also estimate the number of monthly searches for each type of yoga to get a sense of what’s the most popular types of yoga. Please note we use 3rd party software for this data so the numbers are an estimate at best. With Bikram’s recent legal troubles, I’m not sure whether this style will continue or whether it’ll be more commonly referred to as Hot Yoga. Yes, I realize there differences between hot and Bikram yoga, but we’ll have to see what happens. When people ask, “What are the different types of yoga?,” Bikram yoga is often one of the first that comes to mind. One of the more rigorous yoga styles, Bikram yoga is performed in a heated room (95 to 108 degrees Fahrenheit). Most sessions last 90 minutes and work through a series of 26 yoga poses and several breathing exercises. Developed in the late 20th century by Bikram Choudhury, it is designed to increase strength throughout the entire body. This form of yoga helps with weight loss, toning the body, and relieving pain from arthritis, knee, and back injuries. Hatha yoga has a gentler and slower pace than some other styles and is suitable for beginning yoga students. It is done in a regular room and incorporates both poses and breathing exercises. Poses can be held for several minutes, making this a relaxing option. This form of yoga can provide stress relief, increase flexibility, and help with adopting better posture. The Hatha style is rooted in the traditions of Gorakhnath, a man who founded the Kanphata Yogis in the 11th century. This intense yoga type uses a connected series of yoga poses. It was developed in the middle of the 20th century by K. Pattabhi Jois and includes numerous advanced moves. Its main objectives are to clear the mind, build stamina, and improve energy levels. It can also improve circulation, flexibility, and strength in core muscles. Hot yoga refers to any kind of yoga that takes place in a heated room. This style is vigorous and causes heavy sweating, elevating the heart rate more than other types. The main objectives are building endurance, strength, and flexibility throughout the body. Hot yoga benefits the body by helping with detoxification and improving cardiovascular health. The invention of hot yoga is attributed to Bikram Choudhury, and it was first widely practiced in the latter part of the 20th century. This relaxing form of yoga incorporates poses, breathing exercises, meditation, and mantra recitation. Movements generally focus on the spine and belly areas, and slow breathing and meditation are designed to maximize positive energy throughout the body. It helps focus the mind, ease tension, and improve mood. It can also increase flexibility and is a good choice for those with anxiety or depression. Kundalini yoga was popularized by Swami Sivananda in the 1930s. This intensely rigorous yoga focuses on fitness and is based on the Ashtanga style. Power yoga became popular in the United States in the 1990s, and both Bryan Kest and Beryl Bender Birch are credited with its development. Designed to provide an aerobic workout, the style focuses on improving strength, flexibility, and endurance. In this style, yoga poses can be done in any order, keeping each session interesting. Due to its intensity, this yoga style is a good choice for those looking to lose weight. This relaxing form of yoga is appropriate for beginners and was invented by Bellur Krishnamachar Sundararaja Iyengar in the early 20th century. It is based on the Hatha style and is considered one of the most traditional forms of yoga. It emphasizes precision, proper technique, and postural alignment. Benefits include pain relief for the back and neck, improved mood, an increased sense of concentration, and better muscle tone. Vinyasa yoga is a flowing kind of yoga in which poses are connected together in different sequences. There is a lot of variation in the way this style is taught, and classes can be at a relaxing, moderate, or high level of intensity. Some classes in this yoga form may also include meditation. Vinyasa yoga improves cardiovascular health, relieves stress, improve strength, and create a stronger mind-body connection. This form of yoga dates from the Vedic period. Prenatal yoga is designed to provide a safe yoga experience for expectant mothers. It is a gentle style that can be performed at any stage of pregnancy. Major objectives focus on breathing, centering the mind, and simple poses that provide gentle stretching. Prenatal yoga can help with improving sleep, reducing anxiety, and alleviating lower back pain, headaches, and nausea. It also increases the flexibility and strength of muscles involved in the birth process and can help mothers form a stronger bond with their unborn baby. Prenatal yoga was developed in the late 20th century and varies widely depending on the teacher. This relaxing kind of yoga is rooted in the Hatha style and includes over 250 possible poses. The style emphasizes the spiritual elements of yoga, including gratitude and appreciation for life. During poses, students are encouraged to focus on proper alignment, and classes usually end with meditation or relaxation. John Friend, an American yoga teacher, is credited with popularizing this yoga school in the 1990s. Anusara yoga helps students feel calmer, uplifted, and more connected to their spiritual side. It can increase mental resilience, improve posture, and help make the body more flexible. This is a very slow, relaxed yoga type. Categorized as a passive form of yoga instead of an active one, yin yoga students use a variety of poses that are done in a sitting or lying position. Poses are held for as long as three to five minutes. The goal of this style is to increase flexibility of the connective tissues, including tendons, ligaments, and fascia. The practice also aims to increase circulation in the joints of the body. Invented by Paulie Zink in the late 1970s, yin yoga can help students improve their overall mindset and feel more connected to their bodies. The Jivamukti style includes connected poses that flow from one to the other. It is considered a vigorous yoga form. Invented in 1984 by Sharon Gannon and David Life, the practice also emphasizes lifestyle elements such as veganism, meditation, and nonviolence. This type of yoga can provide an aerobic workout that improves cardiovascular health, and its spiritual principles can help students feel happier and find more meaning in life. Established in the 1960s by Swami Sivananda, this form of Hatha yoga is very relaxing and emphasizes breathing, meditation, and positive thinking. Classes are held without music so that students can focus on their breathing and on appreciating silence. Relaxation sessions are held at the end of the class. This type of yoga is appropriate for all skill levels and age groups, including children and seniors. Sivananda yoga is similar to the Iyengar style and promotes stress relief, better sleep, pain relief, and a closer mind-body connection. This form of yoga combines elements of six classical yoga methods, including the Hatha style, and focuses on integrating the mind, body, and spirit. It was developed in the 1960s by Sri Swami Satchidananda. The style is very gentle and includes breathing, chanting, mantras, and meditation. Considered one of the most holistic yoga forms, the style aims to help students become better people and find inner peace, joy, and their true selves. The Kripalu style adopts a relaxing, gentle approach and is suitable for all ability levels and age groups, including people with chronic medical conditions. It was created by Amrit Desai in the 1960s. The style focuses on the body, mind, and spirit and is notable for its highly adaptable, individualized approach and welcoming environment. 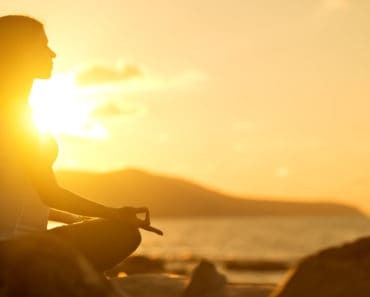 Breathing exercises, gentle poses that are held for varying lengths of time, and meditation are all part of Kripalu practice. It can be beneficial in reducing pain, improving muscle strength and tone, increasing stamina, and building mental strength. Restorative yoga is based on the 20th-century Iyengar style and is one of the most relaxing forms of yoga. Suitable for all ages and abilities, the practice uses a maximum of six different poses that are held for several minutes. Typical poses may include gentle twisting poses and bending forwards or backwards while in a sitting position. Unlike other forms of yoga, this style uses props, including pillows and foam blocks, to support the body and allow for total relaxation and deeper stretches. This style also incorporates meditation and breath work and can be beneficial for anyone who is experiencing chronic pain or stress in their personal life. Restorative yoga can help improve mood and concentration, increase resilience, promote mind-body awareness, and improve both flexibility and muscle tone. Described by some as a “physical therapy” version of yoga, the main objective of viniyoga is to be a custom-made yoga practice that is adaptable to any individual’s needs and ability level. In short, it can be anything the student wants it to be. It can be done by those who have active injuries or chronic medical conditions. 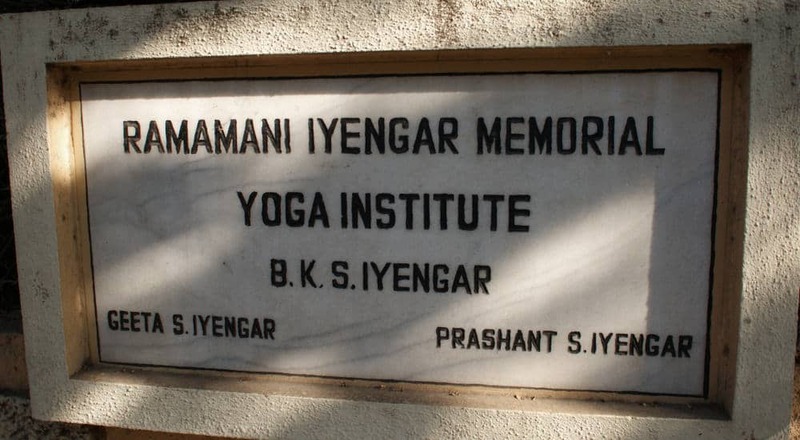 Viniyoga was developed in the 1970s by Krishnamacharya. While it is taught in group classes, this type of yoga is also ideal for private lessons. Viniyoga includes breathing exercises, chanting, meditation, and movements. Movements can be tailored to any level and can be gentle or more intense based on the student’s wishes. Students with pain will be shown modified versions of certain poses to avoid re-injury and promote return to normal function. Viniyoga can help those who are injured or experiencing pain reduce any symptoms they may be experiencing, improve their flexibility and muscle strength, and increase their stamina. It often aids students in making a faster recovery from any ailments. This relaxing type of yoga emphasizes the spiritual essence that is at the core of all yoga practices. Based in the tradition of Hatha yoga, it was developed in the 1940s and 1950s by Kriyananda, a follower of the yoga guru Paramahansa Yogananda. Related to Kriya yoga, Ananda yoga is based on the self-realization fellowship created by Yogananda and focuses on affirmations, raising levels of energy awareness and inner awareness, learning greater energy control, and approaching the higher levels of consciousness. While other forms of yoga use spoken affirmations, the affirmations in Ananda yoga are said silently while performing various poses. This style of yoga has many spiritual benefits and will help students with stress relief. It can improve mood, reduce anxiety and depression, and help practitioners embrace positivity and find hope in their lives. Ishta yoga is a highly adaptable form that can be gentle, moderate, or intense depending on the student’s needs. It was developed in South Africa during the late 1960s by Kavi Yogi Swarananda Mani Finger and Yogiraj Alan Finger, a father-son duo. It includes physical yoga poses and spiritual elements such as breathing exercises, meditation, and mantras. Like restorative yoga and viniyoga, the Ishta style allows the student to draw from many different facets of yoga according to his or her physical and spiritual needs. Its main objectives are to help students find their true essence and free themselves from dualistic, “right or wrong” thinking styles. Some students do this with intense, flowing, and fitness-based yoga moves, and other students achieve this by gentle stretching and breathing. Depending on the exercises chosen by the student, this form of yoga can improve cardiovascular health, aid weight loss, increase muscle tone, flexibility, and stamina. It spiritually uplifts all practitioners and guides them to a feeling of tranquility and a sense of inner strength. Created in 2008 by husband and wife practitioners Michael Taylor and Tara Stiles, this American yoga technique incorporates elements of tai chi, qigong, and traditional Chinese medicine. Its major objectives are to help students release tension from their bodies, reduce their overall stress levels, and become the healthiest possible versions of themselves. This adaptable practice is focused on relaxation and gentle movement and is suitable for all ages and levels of physical ability. The term strala is a Swedish word that translates as “radiating light,” and this form of yoga helps students learn to move more freely with less strain. Mentally, the style uplifts the mind and helps to unlock what psychologists term “flow state,” a state in which there is heightened creativity. The inclusion of traditional Chinese medicine makes this yoga form ideal for anyone who is searching for physical or spiritual healing. Svaroopa is translated as “the bliss of your own being.” This relaxing yoga form is designed for healing the body and mind. It incorporates a number of different gentle yoga poses that provide deep stretches for various body parts. The overriding objective of this style is to release tension throughout the body. The practice can help lengthen tight muscles, improving their flexibility and suppleness and helping students feel more agile. Particular attention is paid to proper body alignment and the realignment of any areas of concern. Like restorative yoga, the Svaroopa style uses props such as pillows, blankets, and foam blocks to promote deeper stretches and a greater sense of relaxation throughout the body. Each session begins with a pose known as shavasana. This pose is designed to increase a student’s awareness of his or her entire body and to release tension from the student’s tightest muscle groups. More than 100 poses are part of the Svaroopa practice, and major poses may include lunges and spinal twists. Unlike other styles of yoga which require a tightening of the spine for some poses, Svaroopa works on the premise of spinal release, making it an easier form of yoga for anyone who may be experiencing pain, injury, or chronic medical conditions. The Svaroopa style of yoga was created by Swami Nirmalananda Saraswati, whose former name was Rama Berch. In the late 1960s, white lotus yoga was developed by Ganga White. Its main objective is to connect movement with breathing and meditation. This flowing form of yoga connects poses together and is generally considered to be very relaxing. The major benefits of this form include closer mind-body connection, better awareness of one’s breathing, and greater ease of movement and range of motion. Based in the Hatha tradition, this form of yoga was created by Kali Ray. It is a dynamic form of yoga that connects movements together, and its major objective is to generate a wave-like movement with the spine as students move through poses. The wave-like motion is believed to help students generate positive energy that will enable them to combat stress in their lives. This type of yoga is in-between to advanced, and it can create stronger core muscles and enhance mood. The origins of this yoga technique can be traced back to the late 1930s and are associated with Krishnamacharya, a yoga teacher who sometimes used small children as acrobatic “flyers” in his yoga practices. The style combines yoga moves with acrobatics and massage elements. Many of the yoga poses are done while suspended in the air, and most moves require a second person for support and a third person to act as a spotter. This intense yoga method is very advanced and requires a high level of physical fitness and strength. Poses are timed with breathing, and this form of yoga emphasizes being present in the moment and connecting with one’s yoga partner. Acro yoga is appropriate for those with previous yoga experience who cope well with heights. 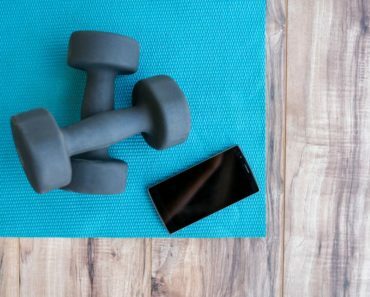 The technique provides a demanding full-body workout that can improve cardiovascular fitness, stamina, muscle strength, and tone. Kriya Yoga is more than just movement of the body. Sure, it does involve controlling your breath and mastering your body’s energy flow in a process called pranayama. But beyond this, Kriya is a spiritual path that helps you keep the best daily practices in your life. It also embodies the true goal of all yoga: unity with the divine powers. With a heavy focus on the spine, Kriya connects you directly with the body’s source of growth. The idea is to control the life force by imagining going up and down the spine. This connects to the body’s awareness and willpower. One Kriya takes only 30 seconds. Although it is an ancient practice, it was revived in 1861 by Mahavatar Babaji and his disciple in the Himalayas. Karma yoga is a very different type of yoga. It doesn’t focus so much on the movements of your body on top of a yoga mat. Instead, it is more involved with how your body moves in the outside world, in the service of others and the world around you. Karma is a common concept, relating to the concept of: do good, and you’ll find good; do bad, and you’ll find bad. So, karma yoga hopes to connect you to a lifelong habit of servitude, whether this means going to a local charity or assisting the homeless. Karma yoga dates back to the sacred Hindu scripture, the Bhagavad Gita. Couples, or partner, yoga occurs in some way in most yoga classes across the world. This happens when, as the name implies, the yoga instructor issues in the order of abandoning the solo act and carrying out some poses in tandem. Instead of these limited moments of coupling, this type of yoga hopes to engage two people fully for the entire time they are active. The goal of couples yoga, beyond improving the practitioners’ own physical and mental health, is to unite two people and ignite intimacy. Therefore, it is often carried out by romantic partners or close friends hoping to forge a stronger bond. It was established by Ganga White and Tracey Rich in the late 1970s. Begun by Dr. Madan Kataria in 1995, laughing yoga is a unique physical exercise that uses the power of laughter. It has become a widespread phenomenon because it is very easy to do and leaves the practitioners happy and wholesome after their workout sessions. More than a yoga technique, the popularity was assisted by a non-political and non-religious growth of laughing circles, who would engage in this yogic practice and invite as many others to join them as possible.